If you are looking for some adrenaline this summer then you can’t get much better than a mountain biking holiday in Austria with Mountain Edge. 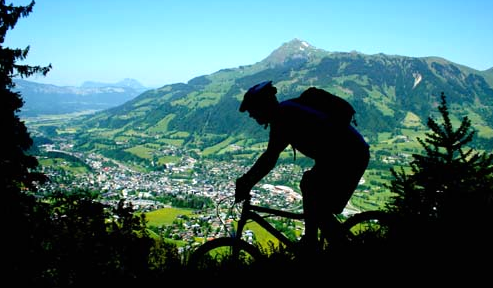 Established in 2003, in the stunning Alpen town of Kitzbuhel, Mountain Edge gives you a holiday to remember with professional guiding and top quality bikes. We first rode with Mountain Edge in 2008 and had such a good time that we went back again in 2009 and ended up buying the bikes that we’d been riding. The best thing is that the Mountain Edge guides are extremely encouraging and give excellent advice to both novice and more experienced riders, ensuring that without even realising it you push yourself and ride trails that you never thought possible, guaranteeing that you end each ride with a huge grin on your face. Couple that with the fact that Kitzbuhel is set in one of the most beautiful parts of the Alps with views that will make you want to stay forever, and a wide variety of mountain biking trails connected by an efficient network of cable cars and you have the perfect mountain biking holiday. Mountain Edge can also help you to enjoy the other thrills that the area has to offer such a rafting, canoeing and paragliding. Half Board or B&B Accommodation. Return transfer from Innsbruck, Munich or Salzburg Airports. Hardtail or Full suspension Kona bike and helmet. For more information visit www.mountainedge.co.uk. To find more hotels in Kitzbuhel and the Austrian Alps, try our Hotel Price Comparison Site.